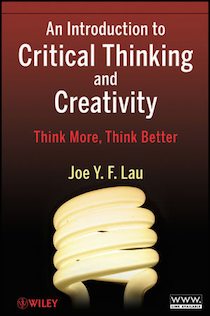 This companion textbook on critical thinking and creativity is written by Dr. Joe Lau, main author of this web site. This book is used by university and secondary school teachers around the world. The content has been developed into a very successful online critical thinking course for university students in China. A Chinese translation came out in 2018. Russian and Mongolian translations are coming soon. Title: An Introduction to Critical Thinking and Creativity: Think More, Think Better. Suitable for the general public, university and high school students. Each chapter contains exercises with suggested solutions at the back of the book. See the book product page on Amazon. An online review of critical thinking textbooks, including this one. You can download the first chapter and the table of contents from the publisher website here.